The report also emphasizes the importance of preparing for extreme but uncertain scenarios involving the rapid loss of the Antarctic ice sheet, which would have an enormous impact on coastal regions. In one such scenario, sea levels along California’s coastline could rise up to 10 feet by 2100, about 30 to 40 times faster than sea-level rise experienced over the last century. 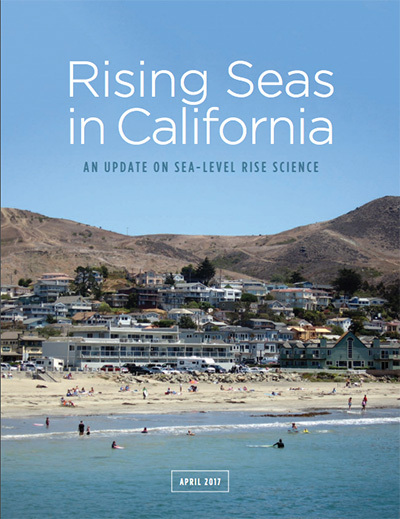 The science report will inform California’s sea-level rise guidance document, which will help cities and counties as they comply with state law that requires them to incorporate climate change into their planning efforts. The updated guidance document will also assist state agencies prepare for and adapt to sea level rise, as directed by Governor Brown’s April 2015 executive order on climate change. Public input will be integrated into the final guidance document update, which is scheduled for adoption by the California Ocean Protection Council in January 2018. The seven scientists who synthesized the latest science as a working group of the Ocean Protection Council’s science advisory team are Gary Griggs, UC Santa Cruz; Dan Cayan, Scripps Institution of Oceanography; Claudia Tebaldi, National Center for Atmospheric Research; Helen Amanda Fricker, Scripps Institution of Oceanography; Joe Arvai, University of Michigan; Rob DeConto, University of Massachusetts; and Robert E. Kopp, Rutgers University.